Scroll down to view our selection of holiday homes and villas with pools in Vendee. Wide sandy beaches with great surf, mile after mile of cycle tracks and delightful forest walks, there’s so much to see and do if you are staying at one of our holiday homes with pools in Vendee. Here’s our guide to just some of the great outdoor activities on offer in Vendee. With few hills (apart from in the north-east of the region) walking in the Vendee poses few challenges and is therefore suitable for walkers of all levels. Guides are available to waymarked routes both on the coast and inland. From Olonne sur Mer a walk of less than five miles takes you along the Cote Sauvage (Wild Coast) and returns via a delightful pine forest. For a taste of the hinterland, an eight-mile walk from Brem sur Mer takes you past fields of sunflowers, vineyards and cornfields. The Vendee boasts over 1000km (600 miles) of cycle tracks across the region, especially along the coast, where a cycle track runs virtually the entire length of the seashore. Inland, the mainly flat landscape, quiet country lanes and sleepy villages make it ideal for exploring by bike for all levels of abilities. Seventy routes are detailed on the website http://vendeevelo.vendee.fr/ with downloadable maps and route details (in French) to help you plan days out. Noirmoutier Island lies just off the Vendee coast and can be accessed by a tidal causeway or bridge. The island can best be discovered by bike, with a traffic-free cycle route taking you virtually from one tip of the island to the other. There are endless opportunities for water-based activities including surfing, windsurfing, dinghy and catamaran sailing. The best surfing is in the south of the region between St Gilles Croix de Vie and La Tranche sur Mer, with both Bretignolles and Longeville favoured locations. The Vendee’s wide, flat expanses of sand, often stretching several miles, provide perfect conditions for sand-yachting and speed-sailing at low tide. For beginners, several schools are on hand to provide instruction in the basic techniques of most activities. Away from the coast, in a more tranquil mode, why not hire a punt or canoe and explore the beautiful Marais Poitevin, known as Green Venice? For an adrenaline pumping day out in the trees, Le Grand Defi is a high-wire forest adventure course with treetop walks, rope bridges and zip wires over a lake. There are routes to suit all ages and for those who prefer to keep their feet on the ground, there are picnic areas and grassy banks to while away the day. If this inspires you, why not browse our selection of holiday homes with pools in Vendee, and see what catches your eye? 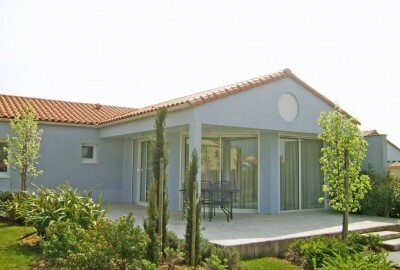 Holiday homes and villas with pools in Vendee. 5% off two week stays between 13th July and 24th August. Villa with private pool on a peaceful and verdant gated residence 5km from the lively seaside resort of Les Sables d'Olonne. Villa with shared pool (high season only) on a peaceful and verdant gated residence 5km from the lively seaside resort of Les Sables d'Olonne.